Allergies can be a real drag, but they don’t have to drag you down. While popping antihistimines is by far the easiest and most popular solution to dealing with seasonal sneezing, it is not the only way. While I won’t tell you to stop taking your allergy meds, I will encourage you to expand your curiosity just a bit. Today, I have three Ayurveda allergy rituals to share that work wonders when added to a regular daily routine. These rituals work best when done sequentially first thing in the morning and/or in the evening. 2x/day is recommend for those with severe seasonal allergies. Breathe better, feel better and live better this Spring! Many have already heard of the wonders the Neti Pot can bring to suffering sinuses! The question is: do you use yours? Jala-Neti is a Sanskrit term that means to “cleanse the nose with water.” It is a technique designed by the yogis of India. Though an ancient practice in the East, Jala-Neti was introduced to the West by the Himalayan Institute in 1972. This daily Vedic practice of saucha (cleanliness) is done by irrigating the sinus cavity with the use of lukewarm water and saline. Multiple studies over the years have proven that nasal irrigation improves sinus-related quality of life, decreases allergy symptoms and reduces the risk of sinus infection. The regular use of the neti helps keep the thin layers of mucus in your nose clean and healthy, while creating deep and unobstructed breathing balances the prana, our vital life force within the body. Purchase a Neti pot (our favorite is at BanyanBotanicals.com). Mix a 1/4 teaspoon of finely ground non-iodized salt in 8 ounces of warm sterile water. Use the purest salt available because impurities in the salt can be irritating. Lean forward and turn your head to one side while leaning over the sink or in the shower, keeping the forehead at the same height as the chin, or slightly higher. Gently insert the spout in the upper nostril so it forms a comfortable seal. Raise the Neti gradually so the saline solution flows in through your upper nostril and out of the lower nostril. No, you’re not drowning. Breathe through your mouth. When the Neti is empty, face the sink and exhale vigorously without pinching the nostrils. Refill the Neti and repeat on the other side. PRO-TIP | Keep you neti + a bottle of purified water in the shower as a reminder to do it every time you're in there! Sister of the famed Neti Pot, Nasya is a subtle and effective treatment that soothes irritated noses by clearing up congestion, reducing sinus inflammation and flushing accumulated allergens from the head. Daily nasal lubrication helps to release tension in the head and relieve accumulated stress. Balancing for vata, pitta, and kapha, Nasya Oil is also traditionally said to improve quality of voice, strengthen vision and promote mental clarity. **Nasya should be ALWAYS be administered after use of the neti. Begin by comfortably lying down on your back and tilting your head back with your nostrils opening towards the sky. If you are lying on a bed, you may hang your head off the edge of the bed, or place a small pillow beneath your neck for support. Place 5-10 drops of nasya oil in each nostril. With skill, you can administer the oil, drop by drop, circling the inside perimeter of the nostril, thoroughly coating the nasal membranes. Take a big sniff in, then rest for a few minutes allowing the nasya to penetrate. Place a drop of nasya oil on the little finger and carefully insert it into the nostril. Nadi Shodhana Pranayama: Nadi (Nah-dee) Shodhana (Show-dun-ah) or Alternate Nostril Breathing is an ancient yogic breathing technique. This simple breathing exercise claims the power to calm and center the mind by harmonizing the left and right hemispheres of the brain. It is also used therapeutically to treat circulatory and respiratory problems. Sit comfortably with your spine erect and shoulders relaxed. Keep a gentle smile on your face. Place your left hand on the left knee, palms open to the sky. Place the tip of the index finger and middle finger of the right hand in between the eyebrows, the ring finger and little finger on the left nostril, and the thumb on the right nostril. We will use the ring finger and little finger to open or close the left nostril and thumb for the right nostril. 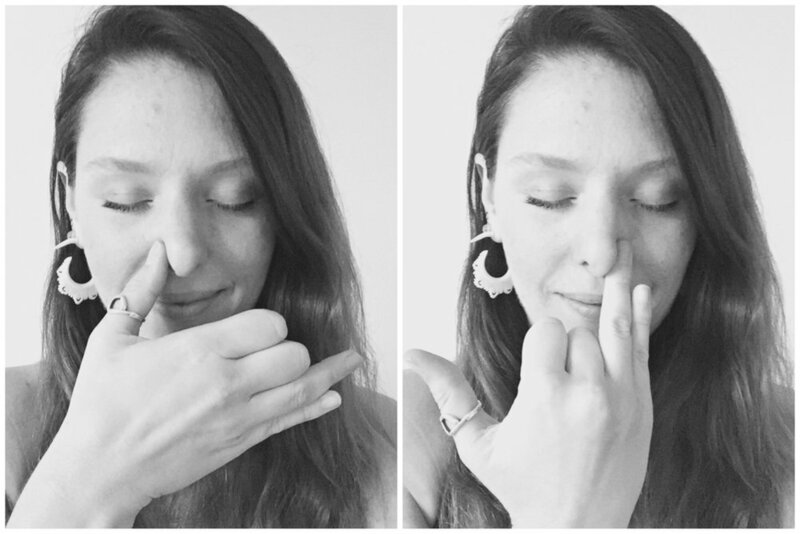 Press your thumb down on the right nostril and breathe out gently through the left nostril. Breathe in from the right nostril and exhale from the left. You have now completed one round of Nadi Shodhan Pranayama. Complete nine such rounds by alternately breathing through both the nostrils. After every exhalation, remember to breathe in from the same nostril from which you exhaled. Keep your eyes closed throughout and continue taking long, deep, smooth breaths without any force or effort.